Old Maps of Bognor, Brighton, Chichester, Haywards Heath, Lewes, Newhaven, Petworth, Rye and Worthing. Here is our selection of maps for Sussex. All include an introduction to the history of the area and most also include extracts from an early directory. 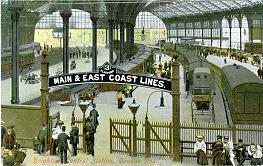 Coverage includes the major seaside towns of Bognor (before it became Bognor Regis), Brighton and Worthing; the cathedral city of Chichester; Lewes, Petworth and Rye, each of them steeped in history; Haywards Heath and Three Bridges, which developed as major commuter centres on the growth of the railways. Lots of variety here. 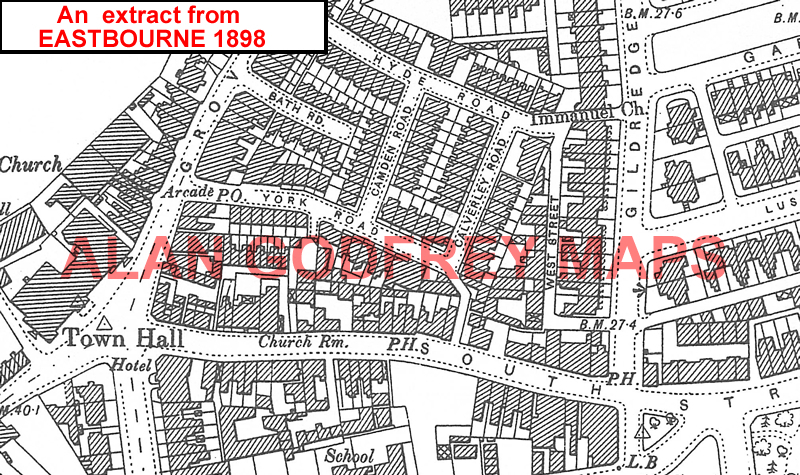 Further information about individual maps is given on our On-line Mapshop. You might find this grid useful for the Battle, Bexhill and Hastings maps. 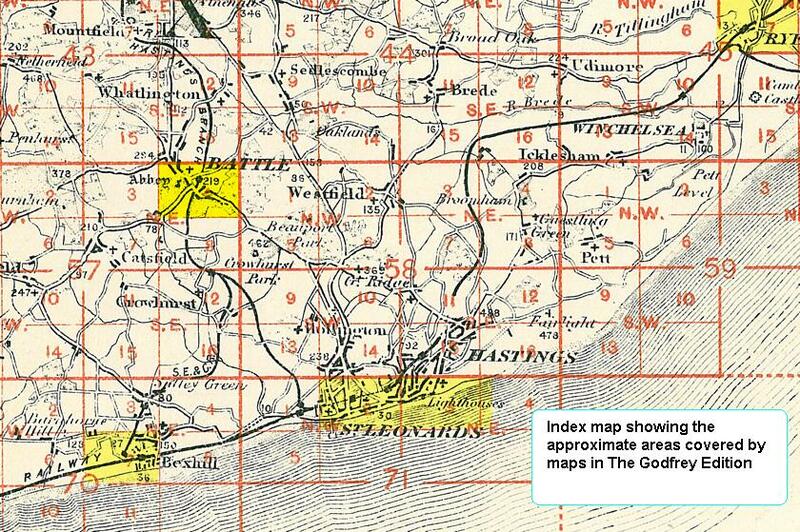 Also in the Godfrey Edition, several of our One Inch to the Mile maps cover parts of Sussex. These cover an area of about 18 miles by 12 miles each, in less detail than our large scale maps, but invaluable for showing villages, railways and canals, and for putting the towns into context. The following are of especial interest to the county. Click on the links for further information. 301 Haslemere & District 1901- Published 2003, intro by Tony Painter. Includes a map of Cranleigh. 302 Horsham, Crawley & St Leonard's Forest 1901 - published 2004, intro by Tony Painter. Includes a map of Slinfold. 303 Tunbridge Wells & Ashdown Forest 1894 - published 2011; intro by Barrie Trinder. Includes a map of Mayfild. 304 Tenterden & District 1893 - published 2010; intro by Barrie Trinder. Includes a map of Hassocks. 316 Fareham, Hambledon & Havant 1894 - published 2011; intro by Barrie Trinder. 317 Arundel & District 1881 - published 2010; intro by Barrie Trinder. Includes a map of Arundel. 318 Brighton & District 1894 - published 2010; intro by Barrie Trinder. Includes a map of Westham. 319 Lewes & District 1894 - published 2010; intro by Barrie Trinder. 320/321 Winchelsea, Hastings & Dungeness 1903 - published 2004, intro by Tony Painter. Includes a detailed map of Winchelsea. 332/333 Selsey Bill, Bognor & Worthing 1901 - published 2005, intro by Tony Painter. Includes a map of Pagham . 334 Beachy Head, Newhaven & Eastbourne 1880-1903 - published 2005; intro by Tony Painter. Includes a map of Litlington . NB. This title includes two different dates for sheet 334, so you can see the changes from 1880 to 1903. See the One Inch page for a complete list.